There's a palpable feeling of uncertainty in the air lately. It's like billions of particles of information, opinions and emotions are floating around, crashing into each other at warp speed but with no real purpose or direction. It's this brain fuzz that makes me search for something real and reliable. The cyclical essence of nature has drawn me into its beautiful rotation and captivated my primal senses. Simplicity, it turns out, is what brings harmony and I'm continuing on my voyage of discovery for places that ignite excitement in my soul. I was lucky to stumble on one of these places in my research of the South Tyrol area. I was nominated for a Stylight Award (thank you, Stylight! I didn't win but so honored still!) and was traveling to Germany for the ceremony and needed to get to the mountains after to shoot an upcoming project. I've heard of the pure, unspoiled beauty that exists in the Alps, especially right in the area where Italy meets Austria. Castel Fragsburg, a five star boutique hotel nestled in the hills above Merano, had somehow found its way into my web search and I was completely charmed. Not only did I feel the desire to go there but I felt called to go there. A mediterranean-meets-mountain climate coupled with a mix of German and Italian influences makes this area incredibly unique. Alpine flowers grow not far from vineyards and you're not quite sure whether you should say Guten Morgen or Buongiorno. The air is intoxicating here. Merano is known as a spa town due to its natural hot springs so the idea of 'wellness' runs deep in the history of the area. 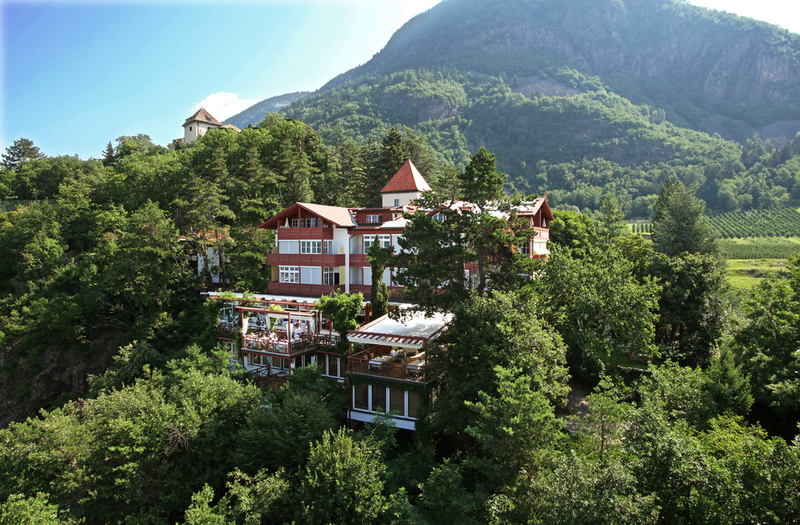 It isn't just the thermal springs and obsession with saunas that makes this place a wellness haven. It's thousands of farms that are nestled between old castles and a vast natural catalog of medicinal herbs and flowers that have flourished here for centuries. Fragsburg has used that history and their unique location to birth and nurture one of the most unique outlooks on spa rituals that I've found in my travels. As we meandered up and down the tiniest European roads I've ever traversed we were rewarded with views of this 16th century hunting chateau converted into a charming hotel. 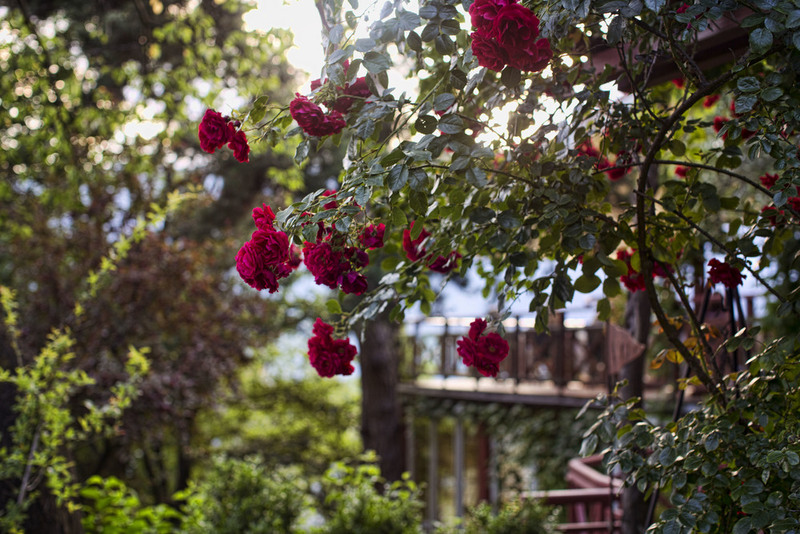 We settled in with drinks in the garden, surrounded by the smell of fresh lavender and roses and the magic began. Here's what made me fall in love with this gorgeous property. As I explored the property I stumbled on a tiny green cottage perched on the ledge. Inside was a visual feast of the local mountains in the distance and spiritual adornments collected from around the world. It's the Sanctuarium where yoga, breath work, meditation and chakra training are held and I wasted no time working out the kinks from sitting during the 3.5 hour drive to the hotel. The space is meant to bring a sense of calm but also give a feeling of freedom. It's not hard to believe because when you spend time looking inward and paying attention to your intentions, there is a sense of freedom and lightness of being that is only heightened by the natural surroundings here. I rolled out the mat and continued keeping up with my ashtanga self-led practice side by side with my fiance. The only sounds were the subtle inhales and exhales of breath mixed with the wind coming up through the valley. Sacred moments! Some things are worth getting out of bed for and a delicious breakfast spread is definitely one of them. What set this apart for me was the care and attention to nature, from herbs and flowers from the garden made into teas, local foraged fruit crushed into delicious jams and homemade smoothies in elegant glass bottles. This was a trend that carried over into dinner at their Michelin star restaurant. It happened to be my birthday while we were staying there and we tasted some local wines and had a wonderful multi-course meal that honored the balance of German/Italian heritage and I found local edible flowers decorating the plates. It's one of the most memorable birthday meals I've ever had! This is where my heart really skips a beat. I've been spending a lot of time studying botanicals and trying to make sense of the ancient way of knowing. It feels overwhelming because I grew up surrounded by so many synthetic, mass produced things and didn't have that deep understanding of nature. One of the things that drew me to Fragsburg was their master herbalist and natural healer, Renate de Mario Gamper. They have completely rethought how spa rituals should be approached. 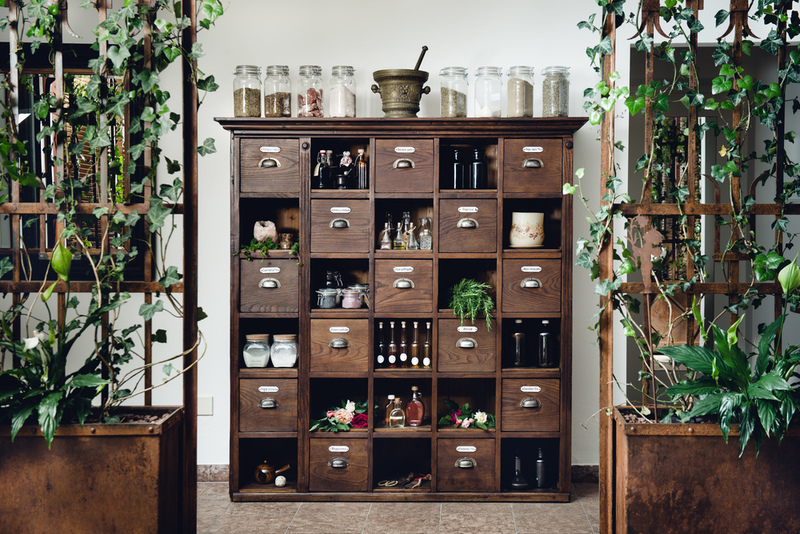 All of the beauty products they use in their treatments (elixirs, masks, oils, etc) are all foraged and created fresh by Renate herself daily or weekly, so whatever the earth is giving or Renate finds in her foraging in the mountains is what they will use in their spa. It's true alchemy. They refuse to compromise the purity of their products. Everything is freshly prepared and wow, what a treat to experience. I had the opportunity to sit down with Renate, with my eyes wide as saucers, to try to understand some of this precious knowledge. Back in the day, women like her would have been considered witches. Their solutions, elixirs, and essences were considered too wild and a lot of information was unfortunately lost. Luckily people like Renate still have a dedication to this ancient craft. She is from these very mountains and spent her childhood around farms with her Grandparents, entrusting the Alpine mountains for their very survival. It was an injury to her foot that changed her fate when it was completely healed by local plant medicine. Since then she has spent her life speaking to nature and understanding her secrets. We had a bit of a language barrier situation so it was a lot of laughing and working to understand each other with a translator. She communicated that a lot of this knowledge is hard to pass on because it comes with such a feeling. She has such a strong intuition with nature that is able to understand the message a plant has by her senses. So instead of transcribing Q&A style I thought it would be great to pass along little nuggets of brilliance that I picked up in my ferocious scribbling on paper. The philosophy of Paracelsus is an influence. He believed that health depended on the harmony between man and nature. There's a deep understanding of chemical process in the body and between plants. She believes that every plant has a sign. Where it grows, how it smells, its taste, will tell you what it is good for or what it should be used for. It takes an incredible connection and observance of nature. For example, Renate observed the extra spiritual energy of the summer solstice, which fell only mere days before my stay. She found an amethyst and that rock was cracked open and was used to brush my hair during my treatment. My treatment specialist said that rock was full of the energy of the solstice. When it hit my head I didn't know what it was because my eyes were closed. Chills were sent down my spine. Truly amazing! Her favorite plants to work with for the skin are roses and daisies. She also loves the mystical powers of Elderflowers. The plant accompanies people from birth to death, bringing elder when a water breaks and planting it around the grave and is used for curing fever, infections and pain. Their commitment to purity and the effectiveness of their homemade products are so beloved by guests but she refuses to package her products to meet the preservative standards of the EU. She will be coming out with some oils to sell and I've made a point to be first on the list to try them and cherish them. I had the Queen's Ritual and my skin was positively radiant when I left. A fresh honey face mask and a serum with evening primrose fluid, pomegranate, rose and pure pearl dust took away every last clue that I had been traveling. If you ever find yourself in South Tyrol, and you should because it is stunning, then I highly recommend spending some time here.